Meanwhile, in 12-inch skillet, heat oil over medium-high heat. Add zucchini, carrots, mushrooms, onions and garlic; cook 5 to 7 minutes, stirring frequently, until vegetables are crisp-tender. Stir in remaining ingredients except basil and cheese. Cook 3 to 5 minutes, stirring occasionally, until hot. Stir in basil. Serve sauce over spaghetti. Sprinkle with cheese. Makes about 5 1/2 cups sauce. 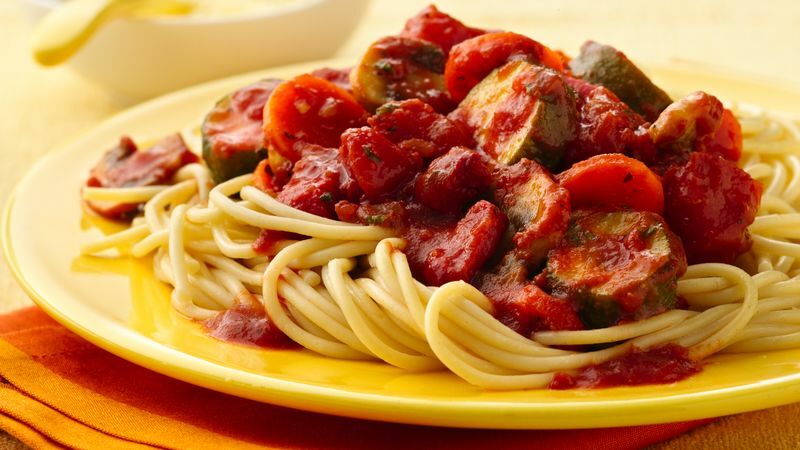 *Find the recipe for the Slow Cooker Spaghetti Sauce on BettyCrocker.com. Add cooked meatballs from the Betty Crocker Easy Meatballs recipe to spaghetti sauce and heat thoroughly for a meaty dinner.